Harrison's Old Time Picnic is always during the weekend of the last Sunday in July (rather than the last weekend of July). 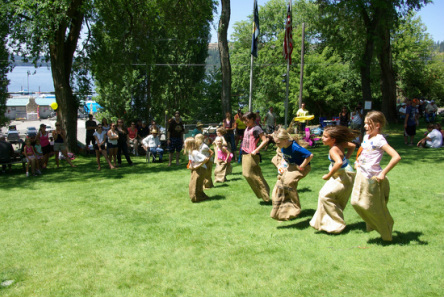 It's a traditional community celebration complete with parade and family-friendly old fashioned games such as sack race, baby crawling contest, and the greased pole climb. There is also a ladies' nail driving contest and a men's obstacle contest. The Searchlight is distributed before the OTP. It contains interviews about the good old days in Harrison and contains the weekend schedule of events. The three-day celebration is mainly a reunion of families and friends of Harrison. People receive prizes for being the oldest Old Timer, the newest one, and the person who has come the farthest to participate in the event. There is a dinner on Friday in the Harrison Grange Hall, where the Coronation of the King and Queen for the year takes place. 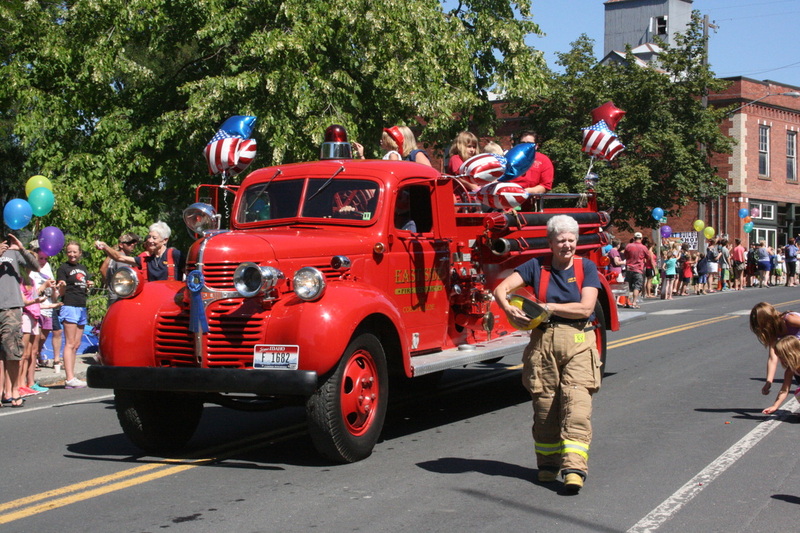 On Sunday, there is breakfast in the city park from 7:30 - 10 am, then lunch after the parade from 11 am - 2 pm. If you would like to be on the mailing list, or have questions or comments, please use the "Contact Us" box below. Harrison's first newspapers were The Foghorn (est. 1895), and Mountain Messenger. They were consolidated as The Searchlight in 1900, which was published as a weekly until 1925. The paper was resurrected in 1953 as an "annual celebration edition" in conjunction with the Harrison Old Time Picnic. Harrisonites had been gathering for the annual picnic in Coeur d'Alene, and '53 is the year the event was moved to Harrison. These days, a volunteer staff publishes The Harrison Searchlight, usually a 40-page tabloid, with much of the work being done by Don Heikkila. Five thousand copies are printed with three thousand mailed to 45 states. Others are handed out to picnic attendees and businesses in town. It costs about $5,000 to print and mail the paper. The Harrison Old Time Picnic funds the annual newspaper by selling advertising in The Harrison Searchlight, having raffles in the park the day of the picnic, and accepting donations. Work on The Searchlight is ongoing all year. Volunteers and articles are always welcome. Contact Don Heikkila at (208) 659-3389 or idfinn@sm-email.com. This Contact information will be forwarded to the Harrison Old Time Picnic / Harrison Searchlight Committee.